Catalan Regional President Carles Puigdemont gestures as he makes an statement at Generalitat Palace in Barcelona, Spain, October 4, 2017. BARCELONA/MADRID - Catalonia will move on Monday to declare independence from Spain after holding a banned referendum, pushing the European Union nation towards a rupture that threatens the foundations of its young democracy. 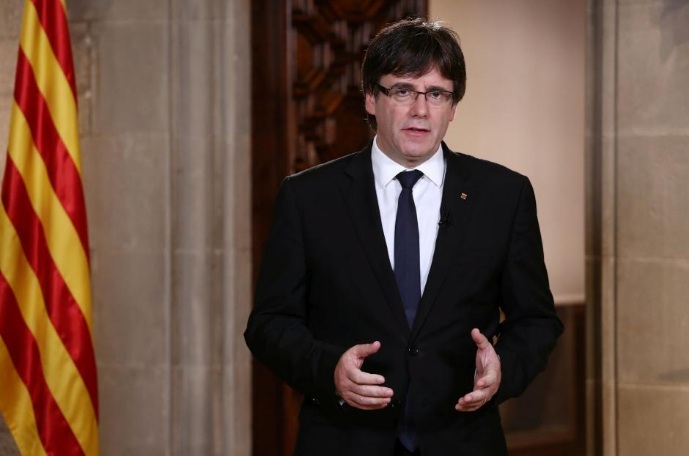 Catalan President Carles Puigdemont said he favoured mediation to find a way out of the crisis but that Spain’s central government had rejected this. Prime Minister Mariano Rajoy’s government responded by calling on Catalonia to “return to the path of law” first before any negotiations. “We know that there may be disbarments, arrests ... But we are prepared, and in no case will it be stopped,” she said on Twitter. Rajoy’s government replied that Puigdemont had wasted an opportunity to put Catalonia back on a legal course. “If Mr. Puigdemont wants to talk or negotiate, or wants to send mediators, he knows perfectly well what he must do first: Return to the path of the law,” it said in a statement. The constitutional crisis in Spain, the euro zone’s fourth-biggest economy, has shaken the common currency and hit Spanish stocks and bonds. Madrid’s borrowing costs have risen sharply and reached their highest since March on Wednesday. The cost of insuring against potential losses on Spanish bank debt and Spanish, Italian and Portuguese sovereign debt has also jumped, suggesting an impact on the wider euro zone. Bank stocks were hit especially hard as the Ibex stock index fell below 10,000 points on Wednesday for the first time since March 2015. In a sign of the nervous public mood, Catalonia's biggest bank, Caixabank, and Spain's economy minister had earlier sought to assure bank customers that their deposits were safe. Puigdemont criticised Spain’s King Felipe VI who on Tuesday lambasted the “irresponsible behaviour” of the Catalan leaders. He said the king had disappointed many people in Catalonia by failing to call for dialogue and he accused King Felipe of endorsing the policies of Rajoy, which he said had been “catastrophic” for Catalonia. The EU executive called again on Wednesday for the Spanish government and Catalan authorities to open a dialogue. “It’s time to talk,” the European Commission’s deputy head, Frans Timmermans, told the European Parliament. Various attempts to find a mediated solution to the crisis emerged on Wednesday.Pablo Iglesias, leader of the left-wing Podemos party, proposed the Spanish and Catalan government try to agree on a mediator while the FC Barcelona football club said it had joined other groups in Catalonia seeking a negotiated solution. Spanish media reports said the Catalan regional government had been in touch with senior church figures to sound out the possibility of them playing a mediating role. But the Spanish government rejected mediation. Rajoy told Iglesias that Puigdemont had to give up the idea of unilaterally declaring independence, a government source said. “That is not negotiable. You can’t deal with people who plan to blackmail the state so brutally,” the source added. Rajoy, a conservative who has taken a hard line on Catalan independence, is considering the unprecedented step of dissolving the Catalan parliament and triggering regional elections, ruling party lawmakers say. But he is struggling to secure support from across the traditional political divide - a lack of consensus that could compound Spain’s worst political crisis for decades. In a sign that Spanish police reinforcements sent to Catalonia might be there for an extended stay, an army logistics unit sent bunkbeds, kitchens and showers to an army barracks near Barcelona in case the police need to use the military base at some point, a Ministry of Defence spokesman said. Some police staying at hotels in Catalonia have come under pressure from local residents to leave. Spain has been jolted by the Catalan vote and the Spanish police response to it, with batons and rubber bullets used to prevent people voting. Hundreds were injured in scenes that brought international condemnation. Catalans came out onto the streets on Tuesday to condemn the police action, shutting down traffic, public transport and businesses, and stoking fears about intensifying unrest in a region that makes up one-fifth of the Spanish economy. “As a businessman, as a Spaniard and as a person, I am very worried and I am scared by what’s going on (in Catalonia),” said Juan Roig, chairman of Spain’s biggest food retailer Mercadona. Pro-independence parties that control the Catalan government staged the referendum in defiance of a Constitutional Court ruling that the vote violated Spain’s 1978 constitution, which states that the country is indivisible. Outside Catalonia, most Spaniards appear strongly opposed to its independence drive.